The thing he misses most about home is his mom and dad: "I miss my parents"
KABUL, Afghanistan (CNN) -- A 14-year-old who was trained to kill by radicals in the tribal regions of Pakistan now sits in a crowded classroom at a detention facility in Kabul. His only wish is to see his parents again. Shakirullah, 14, is convicted of planning to carry out a suicide bombing in Afghanistan. "I miss my parents, my mom and dad," Shakirullah says in soft tones. Like others in tribal regions, he goes by one name. Shakirullah is already a convicted terrorist for planning to carry out a suicide bombing. He says Muslim radicals lied and tricked him into becoming a would-be bomber. "I have been detained for trying to commit a suicide attack," he says. They told him that once he blew himself up he wouldn't die because God would save him for being a true Muslim. Asked what he now thinks of Americans and Westerners, Shakirullah is calm, but quick in his response. "I don't know. God knows what type of people they are, whether they are good or bad. I don't know them," he says. 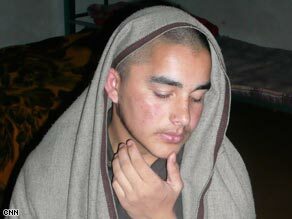 Shakirullah now passes his hours in a cell block at a juvenile detention facility in Kabul. He is serving at least five years in detention. He is to be transferred to an adult prison in a couple of years, authorities say. He hasn't heard from his family in the North-West Frontier Province of Pakistan. He tried to send them a letter through the International Committee of the Red Cross but is not sure it reached them. "I don't know what they are thinking. They have no news of me," he says. On this day, Shakirullah attends a rehabilitation class, easily lost in the crowd of boys with shaved heads. All of the children are convicted for various crimes, including theft, fighting and even murder. Three boys like Shakirullah are here, all guilty of planning to kill themselves and others after being recruited by terrorist groups. With the increased violence in Afghanistan, international observers say they have seen more and more children being recruited by armed groups and national forces. The Taliban, which ruled Afghanistan with its strict Islamic rule from 1996 to 2001, has regrouped and launched a fierce insurgency. Inside the detention center, Shakirullah walks up to his cell, his sandals sliding across the tile floor. The cell block is empty and has metal bunk beds lined across the wall and a television set, ready for the times they have electricity. Shakirullah shares this space with 10 other boys. He sits in the center of the room with a blanket draped around him. He barely makes eye contact and looks away as soon as he does. He is shy, but forthright in his words. "I didn't want to do it but he forced me to go," he says of his recruiter. Rubbing his face with his hand, he says he now spends his time dreaming of his life back home in rural Pakistan. His eyes begin to water and his voice becomes softer when he talks about missing his mother. Asked what he misses most about her, he says simply, "A mother is a mother." His was a life of farming and tranquility in Pakistan, he says. It was also a life that took a drastic turn when his father decided to send Shakirullah for studies at a madrassa. He says his dad wanted him to learn more about Islam and the Quran, something he could not do himself. He says his father didn't know radicals ran the school. In the madrassa, Shakirullah learned to recite the Quran in Arabic, not his native language. He relied solely on the fanatical interpretations the mullahs were giving him. "When I finished reciting the Quran, a mullah then came to me and told me, 'Now that you have finished the Quran, you need to go and commit a suicide attack.' That I should go to Afghanistan to commit a suicide attack," he says. The teenager wasn't given the chance to say goodbye to his parents or siblings when he was driven to the Pakistan-Afghan border and handed over to strangers. He says he was taken to the southeastern province of Khost, a hotbed for terrorist activity in Afghanistan. Suicide attacks have risen in Afghanistan since the U.S.-led invasion to topple the Taliban began in late 2001, after the 9/11 attacks on New York and the Pentagon. Shakirullah says that before the police arrested him, he was learning how to drive a car but that he was not sure how he was supposed to carry out his attack. Khost is the province where a suicide car bomb went off near a voter registration site this past Sunday, killing 16 people, 14 of whom were children. At the juvenile detention facility, Shakirullah and the others are now being taught a different interpretation of Islam. "The teachers educate them on Islam, and explain to them that the acts that they were doing is not right for them and for others," says Mir Fayaz ah-Din, who works and lives with the boys at the facility, mentoring them and helping them in their rehabilitation. "The way you want to kill yourself and someone else -- it in itself is a big offense in Islam." Shakirullah now says of his recruiters, "They cheated me."